From market analysis to implementation, The Innova Group brought to Memorial Medical Center its proven ability to deliver expert integrated planning. The new 40,000 square-foot Healthplex serves as a strategic link between past needs and future opportunity, anchoring the ongoing implementation of MMC’s master plan. Memorial Medical Center (MMC) serves the 300,000 residents of Las Cruces and greater Doña Ana County, offering comprehensive inpatient and outpatient care that includes the latest in diagnostic, therapeutic, and rehabilitative services. Challenged with the need to expand services to keep pace with their growing service area, MMC called on The Innova Group to define the best use for existing facilities and to identify which services would be optimized through new facility construction. The Innova Group first supplied critical market analysis, including medical workload forecasts by product line, competition analysis, and regional scenario planning. 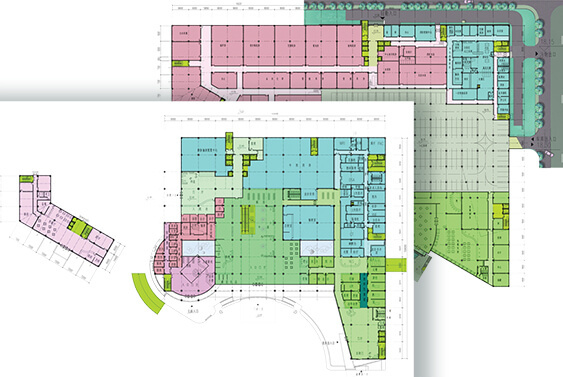 With a clear foundation for facility need identified, Innova teamed with Holmes Sabatini Associates to provide comprehensive facility master planning. Innova’s customized solution called for hospital expansion and renovation, including building the Healthplex, a $55 million, free-standing diagnostic and surgical center. The Innova Group played a key role in hospital programming to ensure this facility solution truly reflected projected services demand. Innova then assisted implementing the master plan through medical equipment planning and project management supporting the Healthplex construction.